A historian is often only a journalist facing backwards. Why didn’t Eternity have this deformed age aborted? Its birthmark is the stamp of a newspaper, its medium is printer’s ink, and in its veins flows ink. Today’s literature: prescriptions written by patients. To be sure, the dog is loyal. But why, on that account, should we take him as an example? He is loyal to men, not to other dogs. Democracy means the opportunity to be everyone’s slave. Jealousy is a dog’s bark which attracts thieves. Female personality is insubstantiality ennobled by unconsciousness. 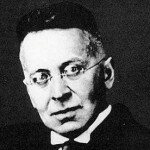 Karl Kraus was an Austrian writer and journalist, known as a satirist, essayist, aphorist, playwright and poet. He is considered the first major European satirist since Jonathan Swift. He directed his satire to the press, German culture, and German and Austrian politics.